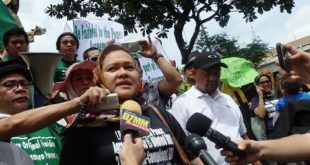 DAVAO Mayor Sara Duterte-Carpio barnstormed for Hugpong ng Pagbabago candidates in Misamis Oriental and Cagayan de Oro yesterday. 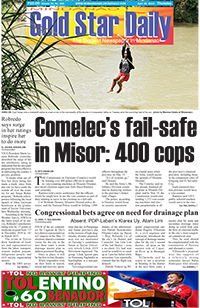 The presidential daughter’s first stop was Gingoog, Misamis Oriental’s first and oldest component city, where she campaigned for Hugpong’s senatorial candidates. 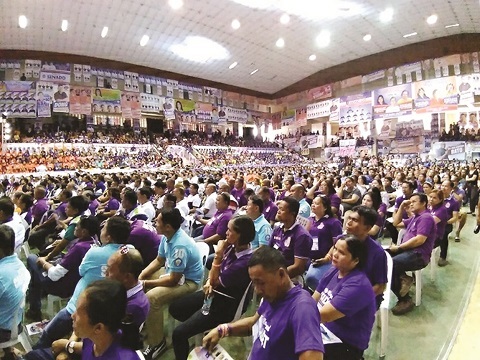 Duterte-Carpio endorsed Hugpong’s senatorial candidates, and subsequently raised the hands of local candidates at the jampacked Lugod Memorial Gym. Duterte-Carpio arrived at around 10 am at the gym in Gingoog that was tightly secured that even pens were not allowed. Even reporters were barred from bringing pens with them inside. The Hugpong has 13 senatorial candidates. Of the 13 candidates, only senators Juan Edgardo Angara, Cynthia Villar and Joseph Victor Ejercito, former senators Ramon Revilla Jr. and Jinggoy Estrada, former National Police director general Ronald dela Rosa, former presidential special assistant Christopher Go, former presidential political adviser Francis Tolentino, Ilocos Gov. Imee Marcos, and Maguindanao Rep. Zajid Mangudadatu, were present during the Gingoog rally. Police estimated the crowd inside the Lugod gym to reach five thousand, many of them Padayon Pilipino supporters who trooped to Gingoog for the Hugpong proclamation rally organized by the groups of Mayor Marie Guingona and Misamis Oriental Gov. Yevgeny Vincente Emano. 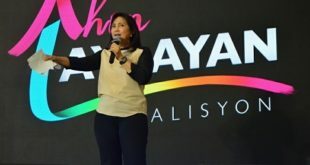 The Guingonas and the Emanos, once bitter political rivals, have forged a political alliance with Duterte-Carpio’s Hugpong regional party. Yeterday, Duterte-Carpio raised the hands of Gov. Emano, Mayor Guingona and her mother Ruthie who is running for mayor of Gingoog again. The younger Guingona has opted to run for vice mayor, her mother’s current position. Except for Rep. Peter Unabia’s son Christian, who is seeking the congressional post in the province’s 1st District, all Padayon Pilipino candidates were present during the ceremonial hand-raising. 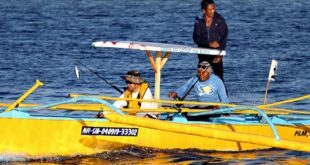 The elder Unabia is running for Gingoog vice mayor against the younger Guingona while his son is seeking the congressional post under the Padayon Pilipino. Vice Gov. 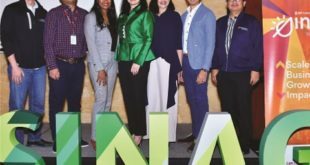 Jose Mari Pelaez, a congressional candidate in the 1st District under Emano challenger Julio Uy’s National Unity Party, said he is the candidate of the Guingonas. 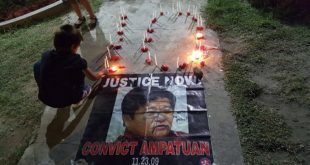 Pelaez said the NUP has also forged an alliance with Duterte-Carpio’s regional party, and the NUP is now making preparations for a political rally with the Hugpong. 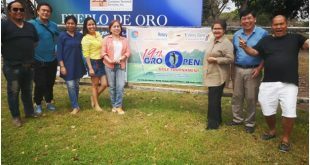 Others whose hands were raised on stage in Gingoog were 2nd District congressional candidate Jose Benjamin Benaldo, vice gubernatorial candidate President Elipe and their candidates for provincial board members and Gingoog city council seats. 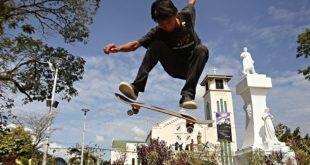 Duterte-Carpio did the same thing in the afternoon at the University of Science and Technology of Southern Philippines (USTP) in Cagayan de Oro. 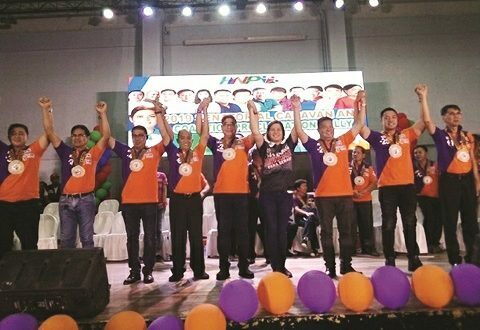 At the USTP gym, Duterte-Carpio raised the hands of mayoral candidate Jose Gabriel La Viña, congressional candidate Rufus Rodriguez and all other candidates of the Padayon Pilipino-Centrist Democratic Party coalition ticket in the city. 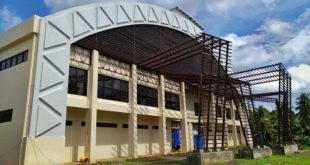 La Viña’s running mate, a frail-looking ex-mayor Vicente Emano, arrived at the USTP gym at around noontime, left at around 1 pm, and did not return for the hand-raising. 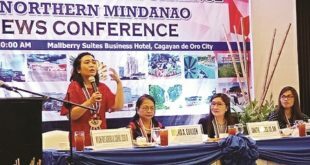 Just like in Gingoog, Duterte-Carpio thanked those who supported her father’s successful 2016 presidential campaign and endorsed her senatorial candidates one by one in a speech that lasted for about half an hour, and did not speak about local politics. After the hand-raising, she left. Duterte-Carpio spent only less than an hour at the USTP. The senatorial candidates who were with Duterte-Carpio at the USTP were Sen. Angara, former senators Estrada and Pia Cayetano, dela Rosa, Tolentino, Marcos, and Mangudadatu. Next Experience the rich culture of Bukidnon at Kaamulan Festival 2019!